Contact Space Needle: Find below customer service details of Space Needle, Seattle, including phone and email. Besides contact details, the page also offers a brief overview of the tourist landmark. One of the most noted landmarks in the Seattle skyline is the Space Needle. Built for the 1962 world fair in Seattle, the futuristic design took shape to symbolize the theme – the age of space. Standing 605 feet tall, the saucer shaped crown offers visitors breathtaking 360 degree views of downtown Seattle, Puget Sound, Mount Rainer, The Cascades and the Olympic Mountains. 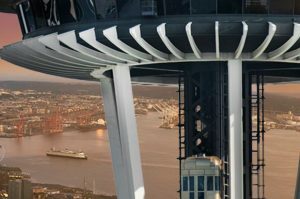 The Space Needle has vertigo enhancing floor to ceiling glass viewing decks and an outdoor deck that enables you to see the ground at a dizzying depth. Visitors can experience two exhilarating experiences – Skyrisers with glass benches and walls and The Loupe, the world’s first rotating glass floor. Your ticket to the Space Needle comes with many inclusions. You will get multiple professionally taken digital photos which include the famous Skyhigh selfie and Zoomie. Visitors can download the Space Needle app and share their experience with loved ones. They can step on to the Skypad and leave a mark on the digital globe by signing on it. For the adrenalin lovers, Stratos VR affords you a chance to participate in a nerve racking virtual reality bungee jump where you could have all the heart –racing thrill without the risk and danger attached to the sport. For a complete evening out, one could take in a casual meal at one of the two dining options atop the Space Needle. The 24×7 open Atmos Cafe is located on the upper observation deck and offers fast food with beer, wine or coffee. The Space Needle opens its doors to visitors from 10am to 8pm Monday to Thursday and from 9am to 9pm from Friday to Sunday to cater to the added rush of tourists. Regular tickets for adults cost between $27 and $37, Seniors can get tickets from between $22 and $32 and for children between the ages of 5 and 12, tickets cost between $21 and $28. Morning visits cost less than the evening ones. There are tickets offering unique experiences. You can choose from Space Needle (general admission), exhibition, glasshouse, museum, and zoo. Group tickets come at a cheaper rate. Tickets can be purchased using Visa, MasterCard, Discover and American Express. The tickets are non-transferable and non-refundable. No cancellations are allowed after booking. Space Needle-branded merchandise are also available to shop online. There are apparel, drinkware and accessories like hats, bags and more. For more information or queries on tickets, timings, events, cancellation, parking, lost and found, or others, reach the Space Needle support.